This is a call for women, of all ages, to come and join us, as we gather together to explore, experience and express our true, authentic, Divine selves. In a safe, peaceful, loving circle of friends, you will join other women, who willing step into a new experience to share her Divine Essence. This time is set aside specifically for us to gift ourselves love, grace and radiant illumination. We gather to share in prayer and supportive understanding. We come to help each other heal hearts, to deepen our connection with our bodies, to train our minds to stay focused on nourishing the eternal flame of our souls. 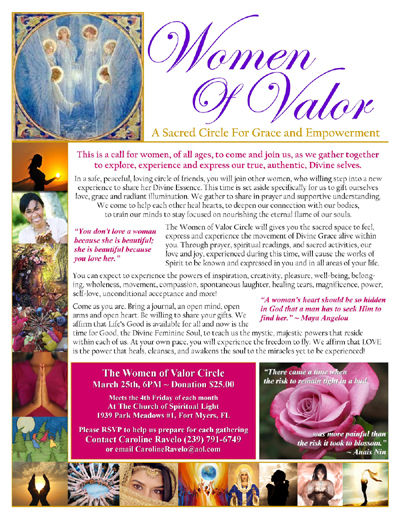 The Women of Valor Circle will gives you the sacred space to feel, express and experience the movement of Divine Grace alive within you. Through prayer, spiritual readings, and sacred activities, our love and joy, experienced during this time, will cause the works of Spirit to be known and expressed in you and in all areas of your life. You can expect to experience the powers of inspiration, creativity, pleasure, well-being, belonging, wholeness, movement, compassion, spontaneous laughter, healing tears, magnificence, power, self-love, unconditional acceptance and more! Come as you are. Bring a journal, an open mind, open arms and open heart. Be willing to share your gifts. We affirm that Life’s Good is available for all and now is the time for Good, the Divine Feminine Soul, to teach us the mystic, majestic powers that reside within each of us. At your own pace, you will experience the freedom to fly. We affirm that LOVE is the power that heals, cleanses, and awakens the soul to the miracles yet to be experienced! 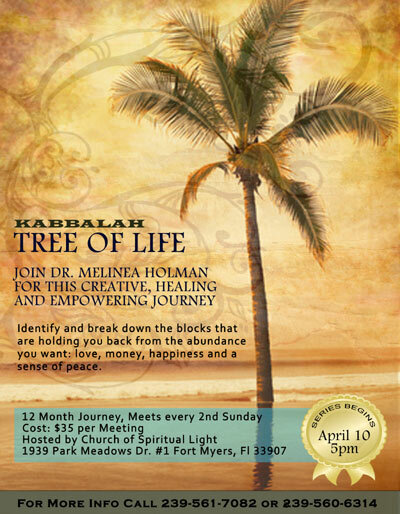 Join Dr. Melinea Holman for this Creative, Healing and Empowering journey to identify and break down the blocks that are holding you back from the abundance you want: love, money, happiness and a sense of peace. 12 Month Journey meets once per month on the 2nd Sunday of the month. You will need to plan on attending each session monthly. (Makeups are granted at the discretion of the teacher and have a surcharge. The spring equinox this month truly ushers in a time of new beginnings. What did you plant? What's coming to fruition for you now or very soon? Life is cyclical and that is never more evident than when we actually start to see some of our projects take root, our ideas blossom, our relationships bloom, and our businesses grow "corn". Get ready for new life everywhere. The wonderful thing about the springtime of our life is that in fact we do get to reap our harvest. This is a fertile time of the year! So take your heart into your hands and accept the luck you have made for yourself. 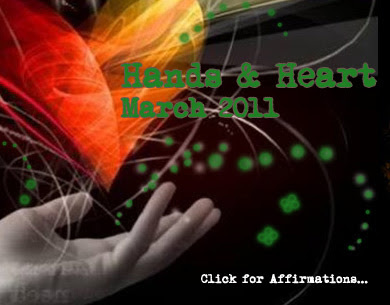 This month we celebrate the connection of our hands to our heart, not just symbolically, but in the work that we do in the world...the actions that we have taken and the creations we have made a reality. So many people in our community and around the world have been very valiant in their own personal growth and willingly faced their shadow. Well groundhog already saw his shadow and now it's time to glow in the radiance of the emerging sunlight and bask in the sweetness of spring. Bright blessings to all! I allow my hands to do the work of my heart. I look forward to my future with faith, hope and joy. I embrace the unknown and allow Spirit to reveal the beauty of my soul. I am free to create a beautiful life. I am open to experiencing more love in my life. I allow my creativity its full expression. My talents are needed in this world. I allow myself to experience the cyclical nature of life with grace. I set up myself to encounter more ease in my day to day life. I release myself from the path of suffering and create beauty in the world. When I am happy and healthy, I send the energy of health and happiness to the entire planet. I feel lucky and joyful. I tap into my highest creativity for solutions and new ideas to help myself and others. I see the path of beauty before me. I am so grateful for the abundance of spiritual support from my community. I am a part of a real human family of mankind. My family extends into my friendships. I am an important part of my community. I am surrounded by loving supportive people. I honor my shadow and my light and see myself whole and healed. I am blessed and I bless others every day. May the circle of love that is my life be unbroken. May I reap the rewards of my creations and quickly correct what is in error. May all my errors turn to blessings. I have the eyes to see and the ears to hear the desires of my heart and soul. May I tap into my imagination to activate a higher vibration of love within my being. Love is all around and within me. I am dancing the sacred spiral of creation. My joy is a blessing to the earth. I touch the lives of others with random acts of kindness. My destiny is to love and be loved.